This example shows how to use slTuner and systune to tune the standard configuration of a longitudinal autopilot. We thank Professor D. Alazard from Institut Superieur de l'Aeronautique et de l'Espace for providing the aircraft model and Professor Pierre Apkarian from ONERA for developing the example. is used to attenuate noise and limit the control bandwidth as a safeguard against unmodeled dynamics. The tunable components are highlighted in orange. Figure 1: Longitudinal Autopilot Configuration. 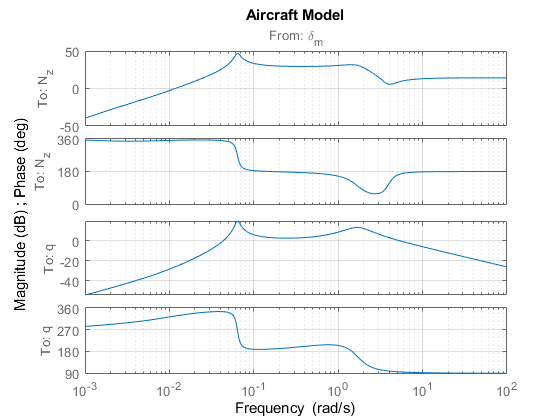 The aircraft model is a 5-state model, the state variables being the aerodynamic speed (m/s), the climb angle (rad), the angle of attack (rad), the pitch rate (rad/s), and the altitude (m). The elevator deflection (rad) is used to control the vertical load factor . 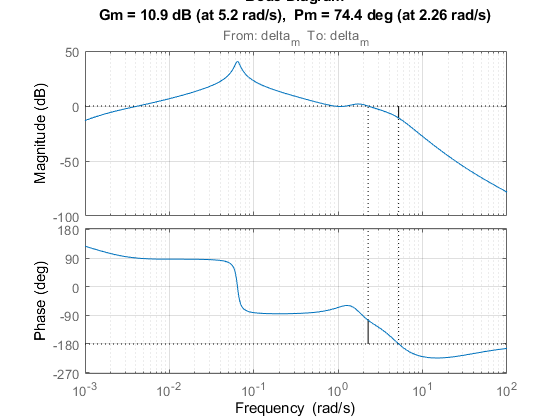 The open-loop dynamics include the oscillation with frequency and damping ratio = 1.7 (rad/s) and = 0.33, the phugoid mode = 0.64 (rad/s) and = 0.06, and the slow altitude mode = -0.0026. Note the zero at the origin in . Because of this zero, we cannot achieve zero steady-state error and must instead focus on the transient response to acceleration commands. Note that acceleration commands are transient in nature so steady-state behavior is not a concern. This zero at the origin also precludes pure integral action so we use a pseudo-integrator with = 0.001. When the control system is modeled in Simulink, you can use the slTuner interface to quickly set up the tuning task. 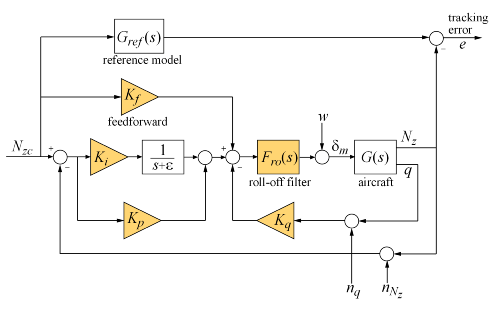 Open the Simulink model of the autopilot. 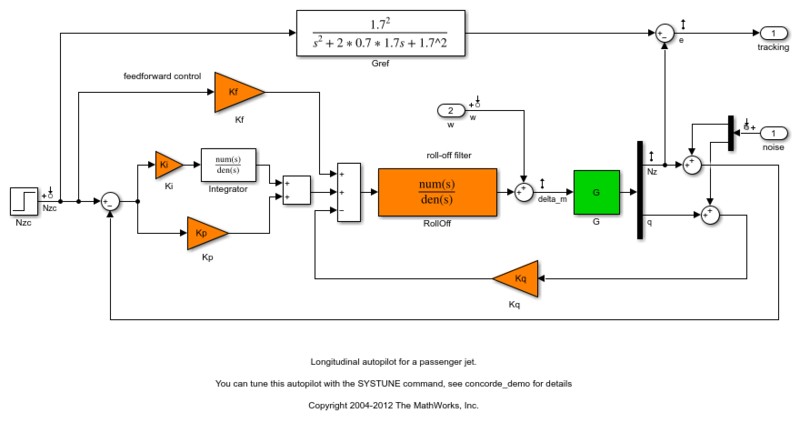 Configure the slTuner interface by listing the tuned blocks in the Simulink model (highlighted in orange). This automatically picks all Linear Analysis points in the model as points of interest for analysis and tuning. create real parameters , build the transfer function shown above, and associate it with the RollOff block. 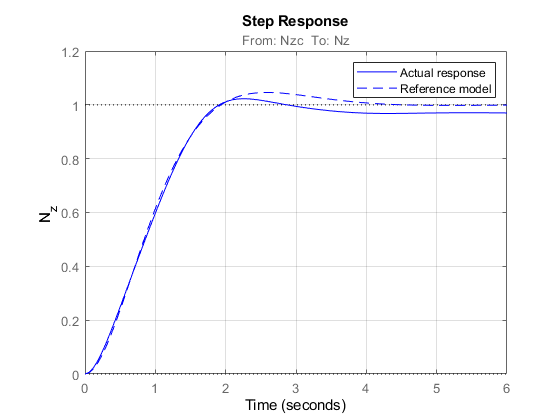 This reference model specifies a well-damped response with a 2 second settling time. 2. 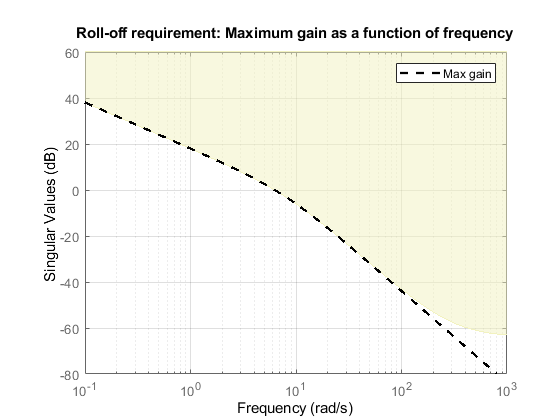 High-frequency roll-off: The closed-loop response from the noise signals to should roll off past 8 rad/s with a slope of at least -40 dB/decade. 3. Stability margins: The stability margins at the plant input should be at least 7 dB and 45 degrees. 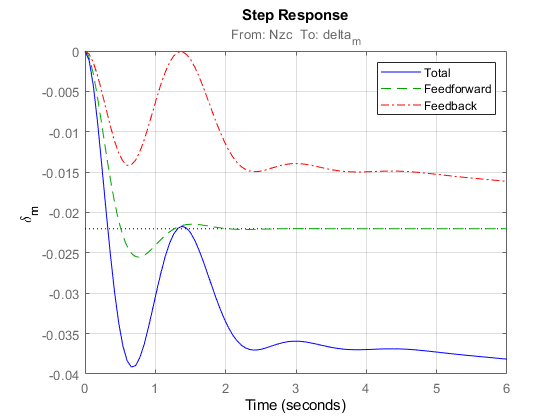 For setpoint tracking, we require that the gain of the closed-loop transfer from the command to the tracking error be small in the frequency band [0.05,5] rad/s (recall that we cannot drive the steady-state error to zero because of the plant zero at s=0). 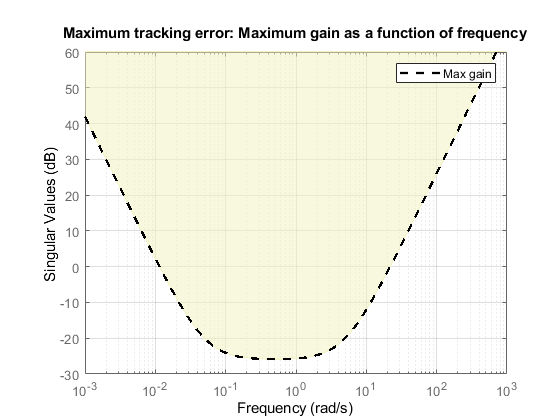 Using a few frequency points, sketch the maximum tracking error as a function of frequency and use it to limit the gain from to . The TuningGoal.Gain constructor automatically turns the maximum error sketch into a smooth weighting function. Use viewGoal to graphically verify the desired error profile. Finally, register the plant input as a site for open-loop analysis and use TuningGoal.Margins to capture the stability margin requirement. We are now ready to tune the autopilot parameters with systune. This command takes the untuned configuration ST0 and the three design requirements and returns the tuned version ST of ST0. All requirements are satisfied when the final value is less than one. Use showTunable to see the tuned block values. Finally, use viewGoal to graphically verify that all requirements are satisfied. 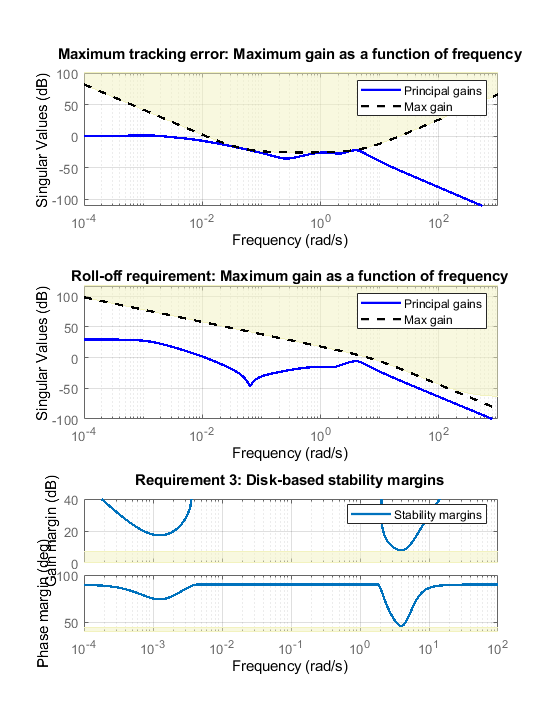 Finally, check the roll-off and stability margin requirements by computing the open-loop response at . The Bode plot confirms a roll-off of -40 dB/decade past 8 rad/s and indicates gain and phase margins in excess of 10 dB and 70 degrees.